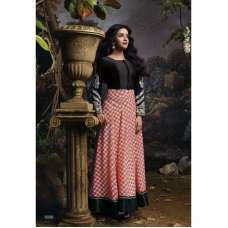 Get an attractive look like ASIN in this exotic Orange & Black colour Printed Georgette Anarkali style suit, which comes with Rayon Bottom and impressive Chiffon Dupatta. An artistic Zari work and thread work is embroidered on it. This Bollywood Style suit will help you notice in crowd.